living on the ground, such as beetles, spiders and slugs. It consists of a container, such as a yoghurt carton, buried in the ground. The top of the container is level with the soil surface, and it is covered by a piece of wood with a slight gap to allow insects to climb in. It is important to check the trap regularly to avoid the animals escaping or being eaten before they are counted. 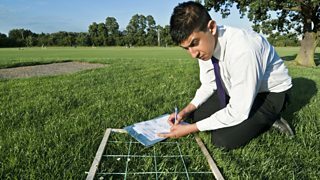 As a result, biologists have developed different ways to estimate the size of a population, including the use of a quadrat. A quadrat is usually a square made of wire. It may contain further wires to mark off smaller areas inside, such as 5 × 5 squares or 10 × 10 squares. The organisms underneath, usually plants, can be identified and counted. Quadrats may also be used for slow-moving animals, eg slugs and snails.